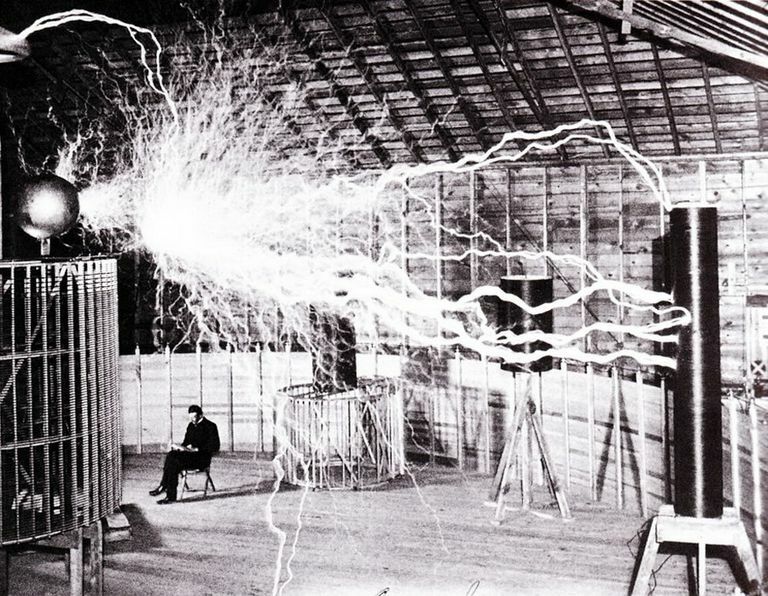 Nikola Tesla sitting in his laboratory in Colorado Springs in December 1899. We have all grown up in a world where electric wires and cables run everywhere. Wouldn't it be great if we could supply power to our electronic devices anytime we wanted, with no cables and no need for batteries? Wireless electricity, sometimes also called Wireless Power Transmission (WPT) may sound like something out of science fiction, but it exists today and looks to be emerging as a big part of our future. Scientist Nikola Tesla demonstrated wireless electric lighting more than 100 years ago. Surprisingly little technological progress was made in this area in the ensuing years for whatever reason; some conspiracy theorists claim interference from the large electrical companies of the day is to blame. Space exploration initiatives of the 1960s triggered the modern wave of research into wireless power. While the long-distance WPT systems that Nikola Tesla dreamed about haven’t yet been built, technology advances in short-range WPT began reaching consumers in the 1990s in the form of gadgets like rechargeable electric toothbrushes. Interest in WPT has exploded in recent years thanks to the popularity of mobile devices. People have grown increasingly frustrated with their phones and tablets running out of charge during the day or having to be plugged in to recharge every night. Short-range wireless charging continues to be by far the most common application of WPT in use today. Traditional WPT relies on a method called inductive coupling but some newer products use magnetic resonance instead. Several different industry efforts continue working to standardize the technology for wireless charging. A group of companies formed the Wireless Power Consortium in 2008 to promote Qi, a specific inductive coupling technology for wireless charging. Many phones and tablets offer Qt support. The Power Matters Alliance (PMA) was formed in 2012. PMA directly competes with Qi and has developed its own technical specifications for use of inductive coupling technology. A third technology for wireless charging named Rezence uses magnetic resonance. A group of companies founded the Alliance for Wireless Power (A4WP) in 2012 to promote Rezence. In 2014, A4WP and PMA signed agreements to adopt each other's standards. While many mobile devices support some form of wireless charging, many others do not. Wireless charging will likely gain worldwide adoption over time as the different technical standards mature. Most wireless charging solutions today require the device to be located on or very near to the wireless charging unit (such as a mat). Devices must also sometimes also carefully positioned to establish a suitable wireless link. Companies that run profitable businesses on the traditional cabled power grids may resist moving to wireless for fear of financial losses.